The World Economic Forum's 2017 Global Shapers Survey represents the voice of more than 31,000 millennials from 186 countries and territories. For the third consecutive year, almost half declared "climate change/destruction of nature" as their greatest concern. Aegon shares these concerns and has developed its own commitments and actions toward tackling climate change, as well as society and the environment at large. In 2015, we signed the Paris Pledge in support of the Paris Climate Agreement. We are also actively engaging with companies on climate issues and have established a working group to put in place the recommendations of the Financial Stability Board’s (FSB) Taskforce on Climate-related Financial Disclosure (TCFD). Importantly, we combine dialogue with action – we continue to look for clean energy investment opportunities. We applaud the respondents to the Global Shapers Survey who also said they are willing to change their lifestyle to protect the environment. In last year’s report, I described my own experience of climate change - the catastrophe of bushfires. They are not started by climate change, but their ferocity and devastation are certainly fuelled by conditions linked to climate change. I remember, as a child, seeing my mother standing on the roof of our home, garden hose in hand, and lling gutters with water as a defence against the fire’s imminent threat. She would have appreciated the #GlobalShapers’ concerns and commitment to action – before it’s too late. At Aegon, responsible investment and dealing with climate change are part of a broader approach to responsible business. For us, responsible business means helping our customers achieve a life time of financial security and well-being. So that we can be a trusted partner for those in pursuit of both prosperous and healthy lives. There is more wisdom my mother could share with young people today. In the early 1970s, she dragged me to the shareholders’ meeting of a small tin mine located in Tasmania. There was a proposed takeover by a large multinational, which she did not want. For retirement systems to be effective, individuals must understand the personal role they play in building up their own financial security, including the markets, products and tools that are available to them. For my parents, it meant an active interest in equity markets and the stocks in which they were invested, property, an aversion to debt, and investing to support retirement, health insurance and life insurance. So what is the message for our clients, especially younger people? Consider that a monthly investment of USD 100 over the next 50 years will yield less than half what it would have done over the past 40 years, given today’s market levels. In other words, millennials will have their work cut out just to match the living standards in retirement currently enjoyed by their parents- and many of them do not yet have a pension or savings plan. And the message from Baby Boomers? Despite the benefit of higher historic market returns on savings in the past, our research shows that America has a health and savings crisis. Baby Boomers have shared their concerns with us: some find they still simply can’t afford to retire, they have a lack of faith in social security and they are worried about the high cost of healthcare in old age. At Aegon, responsible business is about investing in and building retirement readiness and healthy aging – healthy aging supported by a healthy environment. It’s also about sharing our knowledge and expertise. Creating this knowledge means developing a deep understanding of our customers’ needs and requirements. Sharing this knowledge and use our investing responsibly and wisely means caring for our society. 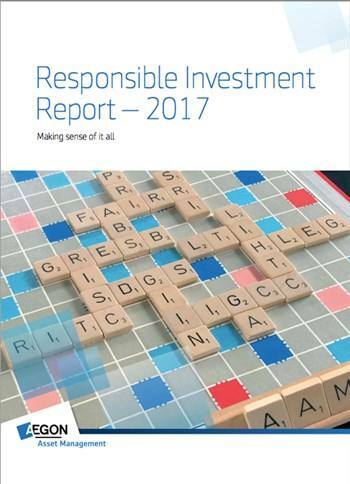 We are proud of the stories we’re sharing with you in this year’s Responsible Investment Report. And our message to millennials is: ensure you take the time to invest the same passion you have for the environment into securing your own financial security. And, if you haven’t done so already, start today.